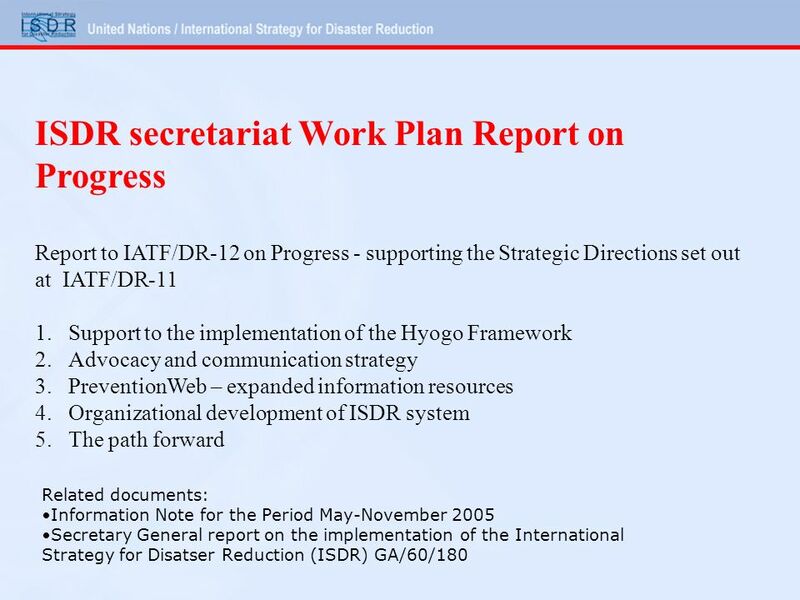 ISDR secretariat Work Plan Report on Progress Presentation to IATF/DR-12 Geneva, 22 November 2005 www.unisdr.org. 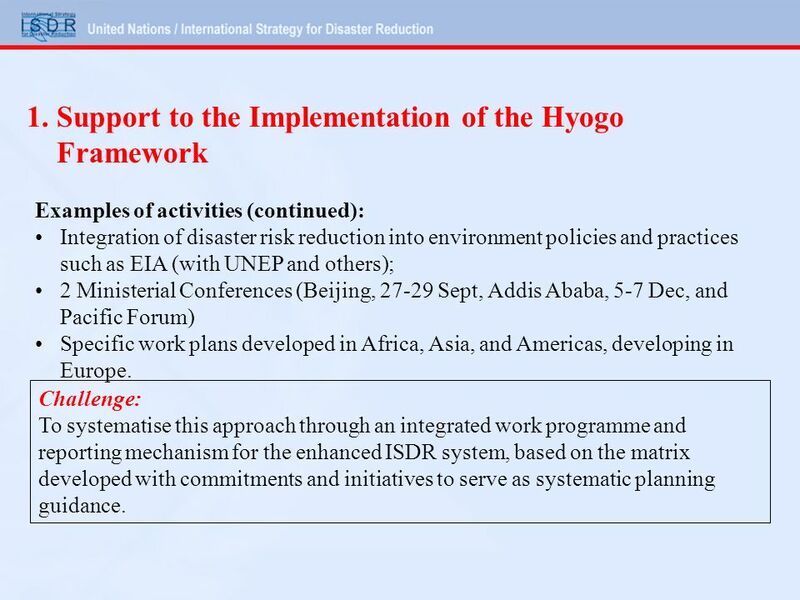 4 Examples of activities (continued): Integration of disaster risk reduction into environment policies and practices such as EIA (with UNEP and others); 2 Ministerial Conferences (Beijing, 27-29 Sept, Addis Ababa, 5-7 Dec, and Pacific Forum) Specific work plans developed in Africa, Asia, and Americas, developing in Europe. 1. 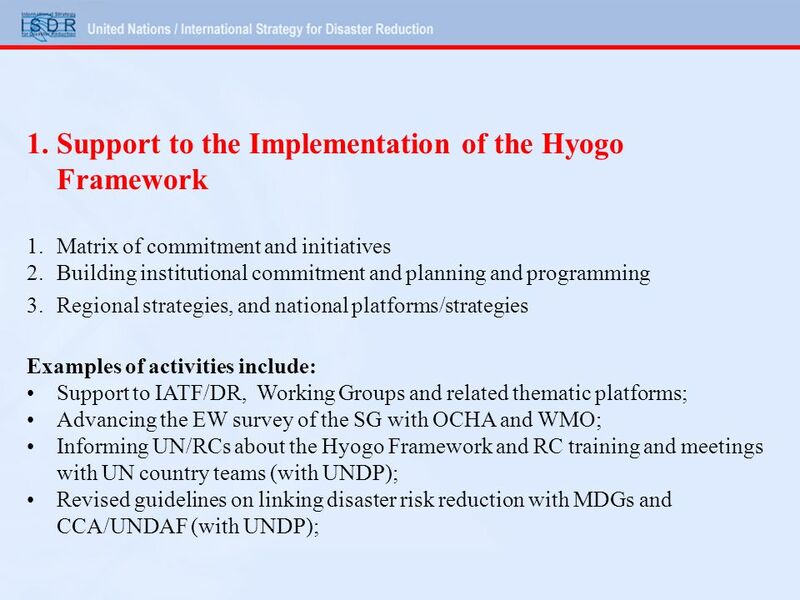 Support to the Implementation of the Hyogo Framework Challenge: To systematise this approach through an integrated work programme and reporting mechanism for the enhanced ISDR system, based on the matrix developed with commitments and initiatives to serve as systematic planning guidance. 5 2. 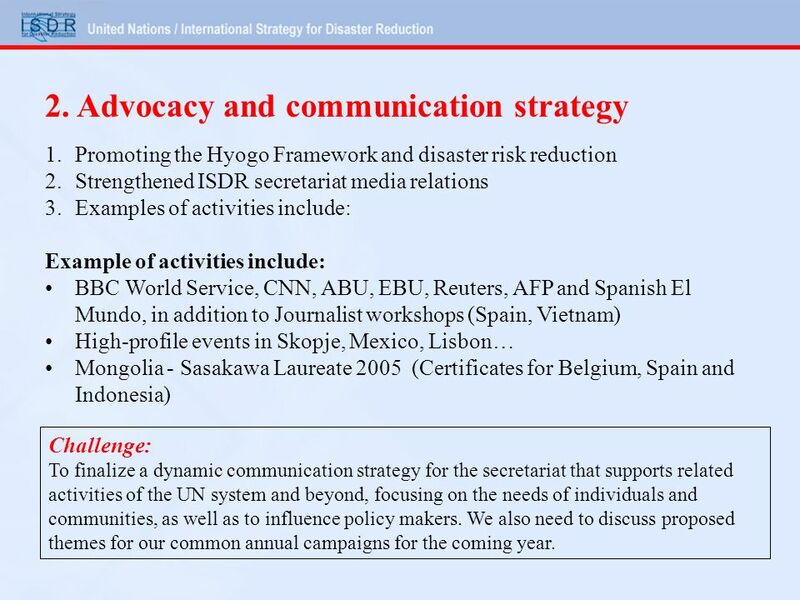 Advocacy and communication strategy 1.Promoting the Hyogo Framework and disaster risk reduction 2.Strengthened ISDR secretariat media relations 3.Examples of activities include: Example of activities include: BBC World Service, CNN, ABU, EBU, Reuters, AFP and Spanish El Mundo, in addition to Journalist workshops (Spain, Vietnam) High-profile events in Skopje, Mexico, Lisbon… Mongolia - Sasakawa Laureate 2005 (Certificates for Belgium, Spain and Indonesia) Challenge: To finalize a dynamic communication strategy for the secretariat that supports related activities of the UN system and beyond, focusing on the needs of individuals and communities, as well as to influence policy makers. We also need to discuss proposed themes for our common annual campaigns for the coming year. 6 3. An expanded information resource 1. 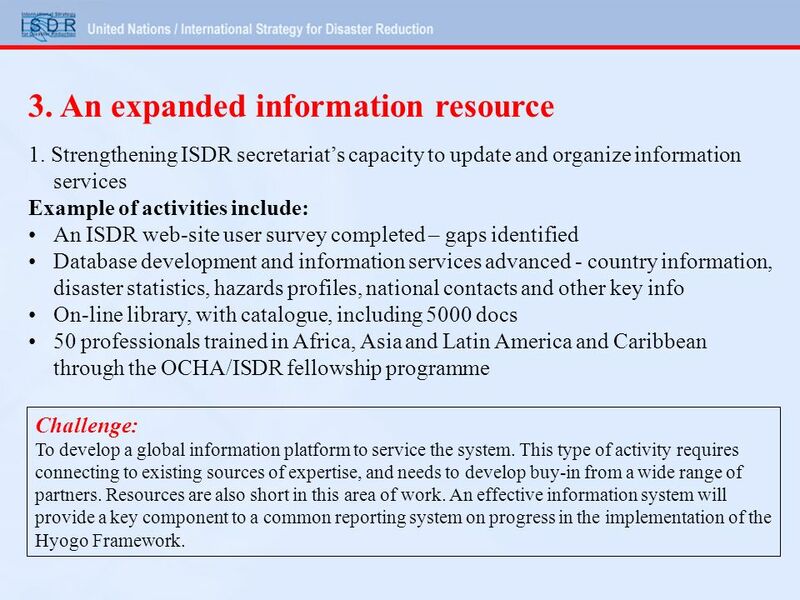 Strengthening ISDR secretariats capacity to update and organize information services Example of activities include: An ISDR web-site user survey completed – gaps identified Database development and information services advanced - country information, disaster statistics, hazards profiles, national contacts and other key info On-line library, with catalogue, including 5000 docs 50 professionals trained in Africa, Asia and Latin America and Caribbean through the OCHA/ISDR fellowship programme Challenge: To develop a global information platform to service the system. This type of activity requires connecting to existing sources of expertise, and needs to develop buy-in from a wide range of partners. Resources are also short in this area of work. An effective information system will provide a key component to a common reporting system on progress in the implementation of the Hyogo Framework. 7 4. 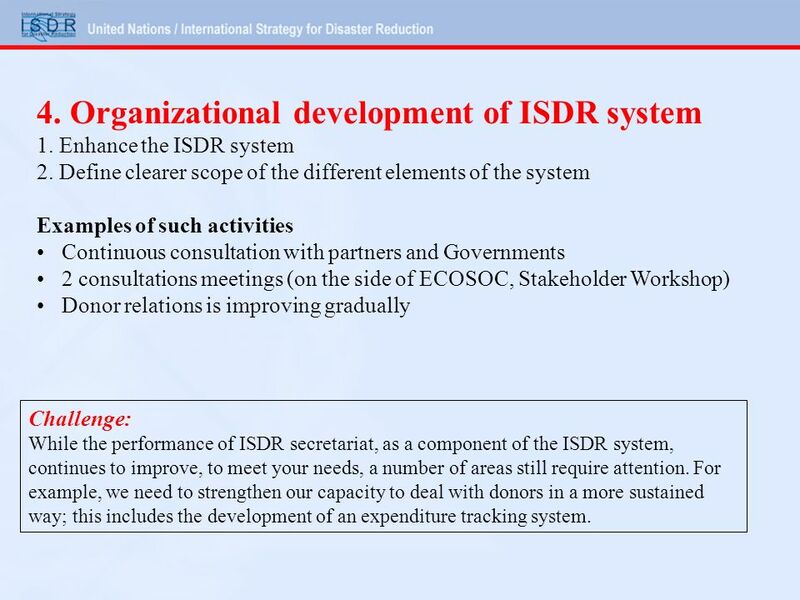 Organizational development of ISDR system 1. Enhance the ISDR system 2. Define clearer scope of the different elements of the system Examples of such activities Continuous consultation with partners and Governments 2 consultations meetings (on the side of ECOSOC, Stakeholder Workshop) Donor relations is improving gradually Challenge: While the performance of ISDR secretariat, as a component of the ISDR system, continues to improve, to meet your needs, a number of areas still require attention. For example, we need to strengthen our capacity to deal with donors in a more sustained way; this includes the development of an expenditure tracking system. 8 5. 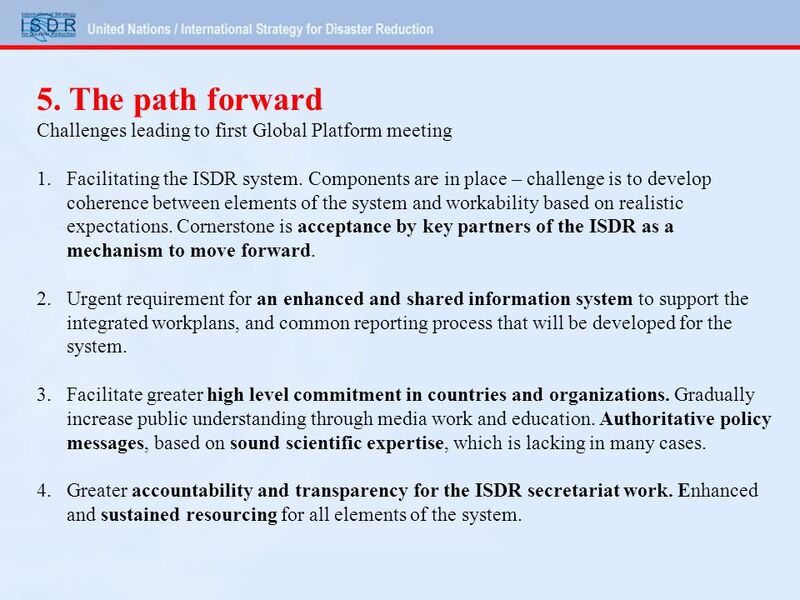 The path forward Challenges leading to first Global Platform meeting 1.Facilitating the ISDR system. Components are in place – challenge is to develop coherence between elements of the system and workability based on realistic expectations. Cornerstone is acceptance by key partners of the ISDR as a mechanism to move forward. 2.Urgent requirement for an enhanced and shared information system to support the integrated workplans, and common reporting process that will be developed for the system. 3.Facilitate greater high level commitment in countries and organizations. Gradually increase public understanding through media work and education. Authoritative policy messages, based on sound scientific expertise, which is lacking in many cases. 4.Greater accountability and transparency for the ISDR secretariat work. Enhanced and sustained resourcing for all elements of the system. 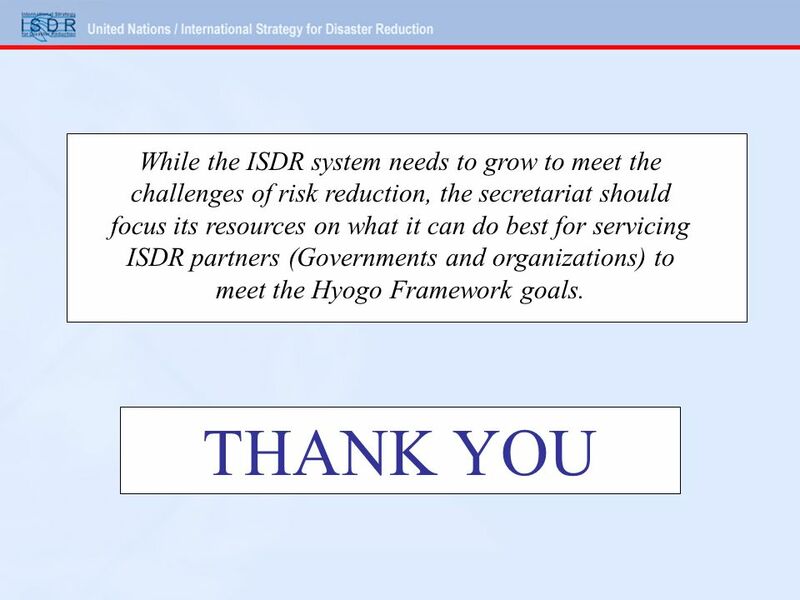 9 THANK YOU While the ISDR system needs to grow to meet the challenges of risk reduction, the secretariat should focus its resources on what it can do best for servicing ISDR partners (Governments and organizations) to meet the Hyogo Framework goals. 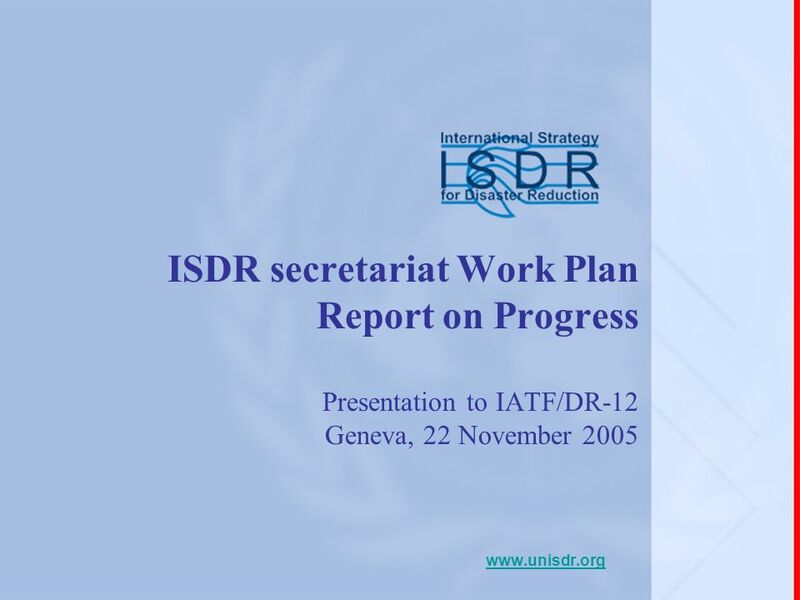 Download ppt "ISDR secretariat Work Plan Report on Progress Presentation to IATF/DR-12 Geneva, 22 November 2005 www.unisdr.org." 1 Information on the Second Africa Regional Platform on DRR and the Africa Status Report Nairobi, 5 – 7 May 2009 Pedro. Serving the information needs of the disaster reduction community Pre-conference event: SADKN Craig Duncan, Senior Coordinator Sarah Wade Hutman, Managing. HFA Monitoring and Progress Reporting Results of First HFA Biennial Review of Progress Shefali Juneja UNISDR, Geneva. To improve the lives of vulnerable people by mobilizing the power of humanity Dr. Patrick Fox SEA DM Coordinator. Recommendations from morning session 7 October 2004 How to improve the role and modalities of IATF/DR, and ensure maximum follow-up to implement the programme. 8 th IATF meeting, Geneva, 5-6 November 2003 FRAMEWORK PROCESS Timelines 8 th IATF meeting Geneva 5-6 November 2003 United Nations International.